The Annual Gingerbread Smash is a very big deal at our house. There are strict rules: each kid takes a turn, youngest to oldest, and each gets ONE swing. No more, no less. It has a loose "out with the old, in with the new" symbolism. 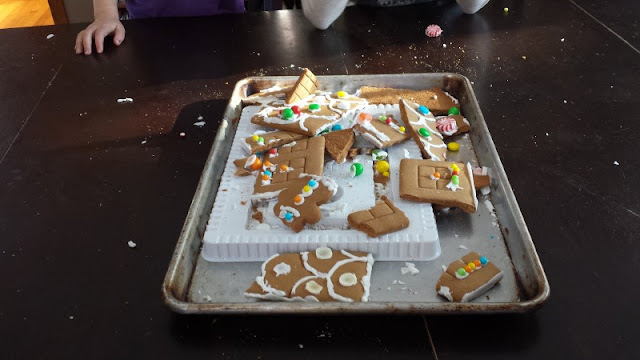 As the kids eat the pieces, we talk about our family goals for the new year. One of our family resolutions for 2018 was to be nicer to each other, which was ironic because an hour later the kids were outside and my son hit his sister with a sled and gave her a black eye. He said it was an accident, but eyewitnesses (i.e: his other siblings) said it looked intentional. So it's still unclear what actually happened, other than us setting a record by failing at our family goal in less than 60 minutes this year. Another one of our family resolutions was to get better about holding regular Family Home Evening (FHE.) That's like a Mormon family devotional you do once a week. Monday evening is the "official" FHE night for Mormons worldwide, but since this year our family has about 300 after-school activities on Monday we've switched to Wednesdays instead. The problem is, we're so used to thinking FHE=Monday that we haven't been very successful at making it happen every week. So we resolved to be regular about it in 2018! For our first Family Home Evening of the year, we talked about our family and why families are important, and the kids collaborated to draw a family crest. They sort of ran out of time and just threw down 8 stick figures in the lower lefthand corner because they couldn't think of anything else, but I think it wasn't too shabby. The rectangle that says "THE BUK OF" is supposed to be the Book of Mormon, but my 6-year-old ran out of room. Please note that pie is included on our family crest. I don't even know why, but that makes me feel so proud to be an Evans. So far, 2018 has gotten off to a rough start. There was of course the black eye incident. Then a severe cold front hit our area and there was a 2-hour cold weather delay for their first day back at school. Too bad the call didn't go out until AFTER my kids had already been waiting at the bus stop for 15 minutes. Also, apparently on late-start days there is no half-day kindergarten, which I didn't realize so I sent my kindergartner anyway. With all the extra time we had, I sat down with her to make a little schedule with pictures of everything she needs to do in the mornings to get ready for the bus (I've been meaning to do this since September because our mornings are a mess.) We finished just in time for another robocall from the school to say that tomorrow was going to be a snow day. 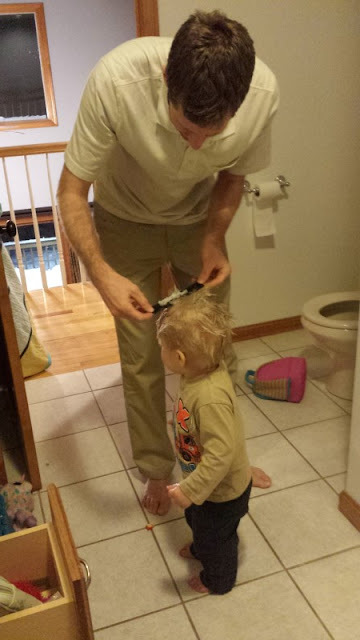 This is a picture of people who have no idea how to remove Vaseline from hair trying to remove Vaseline from hair. 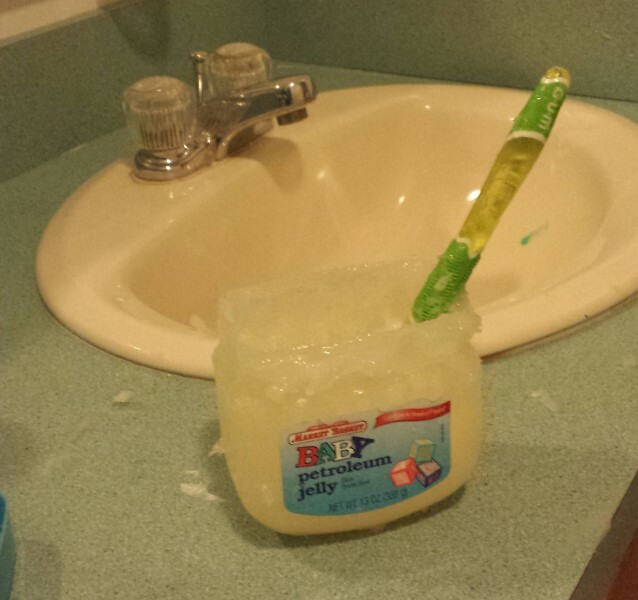 I recently discovered some educational podcasts for kids that I love, and while Phillip was putting the 3-year-old to bed and I was listening to an episode of Bedtime History with the older kids, the 18-month-old was in the bathroom applying half a tub of Vaseline to his hair. I don't know why. There are just no words. I can't imagine who he ever would've seen using Vaseline or a toothbrush that way. It took about 30 minutes; now there's a ring of Vaseline around the tub and I don't even want to know what our pipes look like. We should probably just move. By now I've painted a pretty grim picture of 2018 so far, but it hasn't all been bad. With the extra time off around the holidays, Phillip made great progress toward finishing the basement. He's gone way over the promised deadline of having the insulation and subfloor installed by fall, but that's okay because I'd assumed that (like all DIY home improvements) it was going to cost twice as much and take three times longer than we estimated. So far I'm right on both accounts. To be fair, I'm doing nothing to help aside from limiting the amount of small people headbutting Phillip in the stomach and sticking Duplos in the Shop-Vac while he works. He did ask me last weekend if I could come down to the basement to help him "move crap around" like the couch, and I was like Are you kidding? As a mom, I'm an Olympic level crap-mover. There are entire days when I literally do nothing besides walking around picking things up and putting them away in different locations. Heck yes, I will help you move crap around. Our New Year's Eve was pretty fun. We didn't stay up until midnight, but we did have my daughter's violin teacher and family friend over for dinner and a music party with her husband and two little boys. They're a very musical family and I suppose ours is, too, so we all took turns playing our various instruments for each other. The violin teacher's 2-year-old had even learned a few harmonica songs, but he refused to play for us on that particular occasion. "It's okay," I told her. "He's two. If he actually wanted to do something when you wanted him to do it, that would be extremely weird." Although if he's anything like our kids, he started screaming his head off in the car on the way home because he 'didn't get to play' for us. My 18-month-old gets really jealous when one of his siblings sits on my lap, so I've been trying to teach him about taking turns by saying, "It's so-and-so's turn right now. In a minute, it will be your turn." And it works! And by that I mean he sits there wailing "Tuuuuurn!" until his brother gets so sick of it he gets off my lap and leaves. Oh no! What a start you’ve had to the year. Unfortunately, I relate. I’m just hoping this first week isn’t setting the tone for the year, because if so I’m putting myself in a coma until next year. Oh man, I totally relate. 2018 started off with the stomach flu in our household. It can only go up from here, right? Do they offer elective medically-induced comas? If so, I'm looking into it. Oh no! That Vaseline...toddlers at this age. Our little guy is about the same age as your youngest, and this week (now that my husband is back at work!) he's discovering all sorts of fun things. Currently his favorite activity is crawling on the kitchen table, since he just learned how to climb onto chairs. Your struggles with Family Home Evening remind me of the struggles we're having with family prayer time since Fulton's bedtime got moved up significantly. We all still think of prayer time as 8:30p.m. so when it's 7:15 and Fulton's like "I'M TIRED AND NEED TO GO TO BED NOW." I'm still surprised. I feel like if somehow I can incorporate pie into an earlier family prayer time, things will work out. I'll get back to you on our progress. It's definitely worth a shot! If it doesn't work, maybe try two pies. We just buy one of those nasty $6.99 kits with stale gingerbread that is going to break someone's tooth one of these years. Phillip keeps trying to convince me we should make it ourselves, but that sounds like way too much work and I don't have it in me. A custom gingerbread Death Star sounds like it would be trickier than you think.